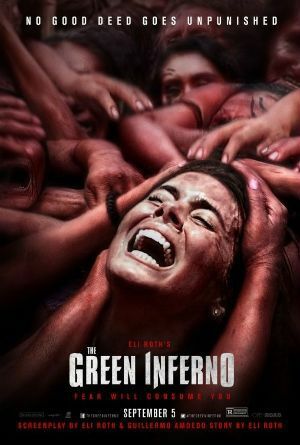 Summary: A group of students staging a protest in the Amazon when their plane crashes and they're taken by a village of blood thirsty cannibals. My Thoughts: I must have to say this movie was much better than I thought it would be. I saw it in theaters a couple days ago and I was surprised at how much I enjoyed the feel of this film. I didn't think it was going to be much. I originally thought it was going to be a bloody, disgusting mess and that I would leave with an upset tummy and a bad taste in my mouth from seeing such a bad movie. It was bloody and disgusting, yes, and the acting was horrendous, but it was more than that. The cannibal genre has really died out in the last couple years and while the movie is mainly about rabid cannibals, there's a serious message presented within this film. I can't quite get what it is because of the film's humorous exterior. It's funny and full of jokes that don't aid the movie in any way. It got a giggle out of a couple of people, but the movie is about cannibals and people are being ripped apart limb by limb, literally, and you add in a guy masturbating or the group trying to get the cannibals high and you just can't really take it seriously and you're left a little frustrated. However, because it doesn't happen so often, it's forgivable. The visuals of the jungle and the camera shots were beautiful, the story of the group and whether or not they'd make it, the death scenes that occurred every couple second and that left me wanting to leave the theater because of how graphic they were and even the creepiness of the tribe and their rituals just made the film for me. A couple of scenes left me cringing because of how dumb they were or how violent they were and while, I did enjoy the experience, there serious message it was supposed to portray didn't come to me because of the humor in it.